A woman moves out of her beautiful seaside home named Il Mare. She leaves a letter in the mailbox, but somehow it is delivered back in time to Sang-hyun, the previous owner of the house. Upon receiving the letter, Sang-hyun, a gifted young architect, refuses to believe that the writer lives two years in the future. Nonetheless the two take up a written correspondence. 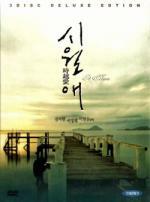 Directed by Lee Hyun-seung, "A Love Story" (Il Mare) is one of the masterpieces of Korean romantic movies and is often compared to the Japanese great hit "Love Letter." The film also hit on Pusan International Film Festival in 2001. It is essentially the same movie as "The Lake House". I liked both. The only real difference is the ending. I prefer the "Lake House" ending but it could be a matter of what you have seen first. Both ending produce a time paradox but I feel that the one in the US version can be explained away whereas with the original Korean ending that is not possible. I willl probably watch "The Lake House" again soon to refresh my memory and give a better opinion of which movie I find superior. and is often compared to the Japanese great hit "Love Letter." As a matter of fact I have another movie in my collection with the same title. It has a similar theme as "Il mare". It was an American TV movie from 1998 where the two main characters corresponded via mail across a time difference of about 100 years. Academy Award® winner* Marisa Tomei (In the Bedroom) and Vincent D'Onofrio (Men in Black) star in this "touching love story" (Boxoffice) about a neurotic New Yorker, her highly eccentric boyfriend and their extraordinary connection. "Cleverly plotted [with] an abundance of heart" (The New York Times), this captivating romance will make you crazy...for love! Ruby (Tomei) is a hopeless romantic who's always attracted to the wrong kind of guy until she meets Sam (D'Onofrio). He's sweet, sensitive, sincere...and from the year 2470. Despite – or maybe because of – his bizarre claims to have traveled back in time to save her, Ruby falls for Sam. And while common sense says he's crazy, her heart says he's the one. A good movie. It keeps you guessing until the end, if Sam is really a time-travellor or simply crazy. - Do you like music? The only real difference is the ending. I prefer the "Lake House" ending but it could be a matter of what you have seen first. Both ending produce a time paradox but I feel that the one in the US version can be explained away whereas with the original Korean ending that is not possible. Originally Il Mare ended right after she puts the letter in the letter-box. The Korean audience however disliked the sad ending during the first screening, therefor the additional scene at the end where the guy actually lives was re-shot. Thanks for the review Tom; I've added Happy Accidents to my wish list. I've always liked Vincent D'Onofrio and look forward to seeing this movie. LOL... believe me I have heard the same type of stuff all my life. But what really gets me... people actually saying they don't believe me. I mean come on... why would I lie about something like that? A lot of people think I am completely weird because I don't like music... but that is ok... not like I can help it. But it's so hard to understand, Pete! What about the five notes from Close Encounters at least? There was 5 notes in Close Encounters? To be completely honest... never even seen the movie before. Remember until recently I wouldn't watch anything I considered old... and the line I drew was 1980... so I am still having to catch up on a many... MANY movies made before 1980 But yes I know there was some sort of tune or something from the space ship... but that is about all I know. Just for Tom I'll watch Lake House. I used to like Sandra Bullock, she was hot in Speed (which for some weird reason also features Keanu). However, Keanu will ever be Ted for me. "Party on dude"
Filmed at the Craters of the Moon National Monument in Butte County, Idaho, this film is noted for its stunning location shots, haunting cinematography, and simple yet effective special effects. Not my cup of tea. It is a little slow for my taste. Maybe it is a movie which gets better when you watch it a second time. Sorry that you have not like it. I agree with you that it's not an action pack movie, but sometimes a slower movie can be good. Even me I have not watch it longer my first try not in the mood for it. But give it another chance when you will be in the mood for an "Autor Time-travel Movie" and you'll be surprise.